In this period the first symptoms of weariness appear. Faith in the ascetic values of the Recollect spirituality decrease and doubts arise about the possibility of integrating these values into the apostolic context of the Province. Inspiration is searched for in less demanding traditions. 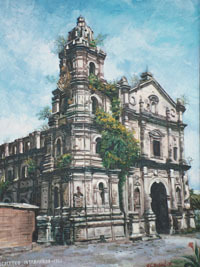 Convent of Intramuros, Manila (1781). Between 1730 and 1749 the traditional pastoral nucleus is dismantled and individual evangelisation is chosen as its replacement. In 1749 only in Masinloc (Zambales) do two Religious live together. Their pastoral work continues to be admirable. In the second half of the century the Province notably extended the field which fate had presented it in the previous century. In 1768 and 1770 they replaced the Jesuits in Bohol and the Marianas islands and they took charge of the entire island of Mindanao, whose administration had been shared between the two Orders since the third decade of the previous century. 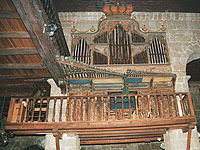 The Organ of Las Piñas. Between 1788 and 1792 A General History of The Philippines appeared in Manila. Consisting of 14 thick volumes, it is, without doubt, the most notable contribution of the Recollects to Philippine literature. In it, Father Juan de la Concepción describes the Philippine history from the arrival at Magallanes until the year 1754. In the same years Father Diego Cera (1762-1832) began his activities as ‘Organ player and Organ builder’. He is famous throughout the world for the Organ of Canes which he built for the Church of Las Piñas. For quite some years now it has been the annual centrepiece of a baroque music festival in which the most renowned specialists in the world participate. Another of the principle fruits of this century was the foundation of the Beaterio de San Sebastián (1719) - the origin of the actual Congregation of Augustinian Recollect Sisters.